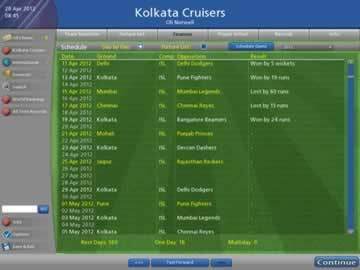 Cricket Coach 2011 Game - Download and Play Free Version! Cricket is one of the biggest sporting sensations to have ever come out of the British Empire, complete with devoted followings in countries all over the world, including Australia, New Zealand and the Caribbean. If you consider yourself to be one of the hundreds of millions of worldwide fans, then you most surely have had fantasies about getting in on the action. With Cricket Coach 2011, you finally can! Take control of a cricket team, fill up a roster with the best players you can find, and compete for honor in the International Series, Test Matches, and even the World Cup! Cricket may be played and enjoyed all across the globe, but Cricket Coach is the only cricket management game that incorporates that fact into the experience. Choose from a selection of over 40 international teams. Play as any of the ten Test Match playing nations, or choose from over 100 domestic sides! Play for teams of minor cricketing countries, including the United States, Ireland, Afghanistan and Scotland, and work at qualifying your team for both the Test Matches and World Cup! The first step to running a successful team will be to recruit the best and brightest cricket players you can find. Get a good balance of skills across the board, train everyone correctly, and you will be unstoppable! Choose from over a thousand players, including real life champions from all across cricket history. Manage over a dozen player statistics, including batting form, bowling form, front foot, back foot, playing spin, offside shot and more! Train your team to improve their abilities. Be mindful of accidents that could put your star players out of commission. Don’t waste your team’s talents! Cricketers age with time and eventually retire. Use them while you have them. After filling up your roster and training your players, it becomes time to get the game underway! Before the moment of truth comes, you have a few more choices to make that will mean the difference between victory and defeat. Determine the positions and lineup of your players. Decide between batting and bowling. Issue instructions to players at every innings. Set their behaviors as defensively or aggressively as you want. Watch play unfold in real time. See all your hard work finally reach fruition! 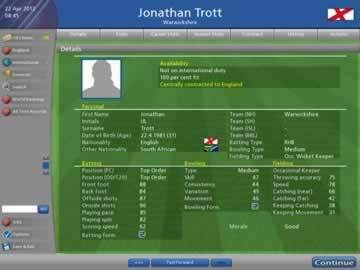 With so many strategic options available, so many players to choose from, and so many ways to win each individual game, there is no other cricket sim that has as much statistical depth as Cricket Coach 2011. If you just can’t get enough of cricket in the real world, then step up to the pitch and pick it up today!